NASA announced that they're getting ready to send Curiosity out on it's first driving mission on the surface of Mars. The little rover that could is heading from it's landing point in Gale Crater to Glenelg, a "natural intersection of three kinds of terrain", to drill for rock samples. Because they plan to test fire the laser before they go, one could say this is a real "rock and roll" maneuver. Even though this is the fourth time we've landed something on Mars, it's still pretty darn neat. This time around, we sent better cameras with the rover, so we can get pictures like the one above. Behold, the first color panorama of the now-famous Gale Crater, the landing site of the Curiosity rover. The next Mars rover will touch down in Gale crater, and explore a 5km high mountain of sediment located inside. The rover, named Curiosity, will launch sometime between November 25th and December 18th of this year. Curiosity will be looking for traces of chemical signs of life in addition to studying the past climates of Mars. The decision to land in the Gale Crater comes after months of debate about where to send the rover. There were four locations on the short list for exploration by Curiosity. 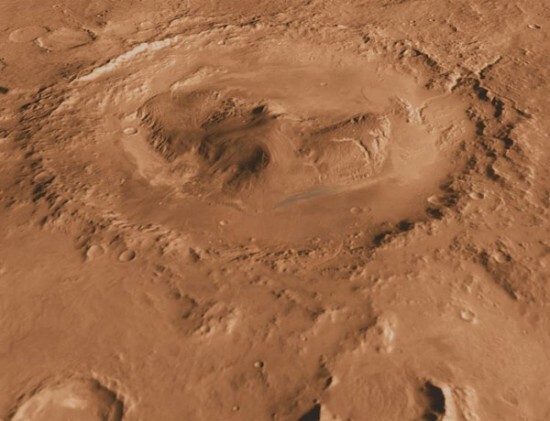 In addition to the Gale Crater, that list included Mawrth Vallis, Eberswalde Crater, and Holden Crater. All the proposed sites are believed to have once featured liquid water. But, it was Gale Crater that won out because its unique sediment mountain contains clays, which are a sure sign of liquid water and perhaps signs of life.